Today I was back out at work to teach a birthday party. 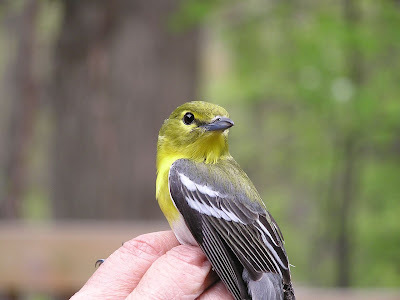 One of the bird banders caught a yellow-throated vireo, the same species that I saw at the tops of the trees on Thursday. Here it is. My afternoon group canceled so I went for a short hike on a beautiful day. I wanted to see a field sparrow. As soon as I got to the field I heard thunder and the wind picked up. The day turned dark and I knew I wasn't going to see much. I saw song sparrows, a robin a common grackle. I headed over to the farm property we own across the street to look for a swamp sparrow and check on things. I discovered someone had stolen the pump well. I didn't see a swamp sparrow. I did however spot a beautiful male American Redstart. Yea! As soon as I got back to the building to do more work inside, the weather blew over and it became beautiful again. Typical. I heard the banders caught a golden-winged warbler so that's another species I'll have to keep an eye out for on the property. While I worked at my desk I could see a little bird flitting around in a tree out the window so I put up my binoculars and sure enough, a Cape May Warbler.